With forecasts for potential flooding along the Red River this spring, the University of North Dakota is evaluating drainage, keeping an eye on the English Coulee and readying to coordinate flood-related efforts with the City and County. 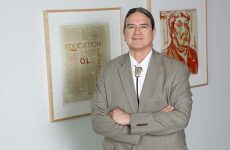 Photo by Shawna Schill/UND Today. A crucial facet of flood preparedness is monitoring the weather reports and acting accordingly, said Jennifer Berger, director of emergency management at the University of North Dakota. So, let’s begin with that. Spring break in North Dakota whipped up a winter storm that dumped 6 inches of snow in Grand Forks. Unlike past blizzards, the one of March 20-21 packed more liquid due to the relatively warm temperatures, following a bluster earlier in the month. Throughout this winter season, a little over 73 inches of snow powdered Grand Forks. As of Monday, according to the latest NWS measurement, snow depth totaled 19 inches, carrying 5 inches of water. While comparisons to the record flooding of spring 1997 have already cropped up, this year’s winter peculiarities remain far distinct from those of 22 years ago. Back then, snow piled over 100 inches over the winter, Lee said, on top of soil soaked with summer and fall precipitation. Dry weather characterized the summer of 2018, although it gave way to wetter conditions later in the year. Yet, “it wasn’t anything extraordinary,” Lee said. Still, NWS predicts a 95 percent chance that the Red River, resting at 15.8 feet at East Grand Forks on March 14, will reach 45.8 feet, nearly a third above its 2017 level. There is a 10 percent chance that it would crest at 54.6 feet, right above the record of 1997. A steady thaw, triggered by temperatures leaping above freezing during the day and dipping back at night, as has been the case this week, would bring about the best scenario. The worst would settle if a cold spell descends on the area, preventing gradual snow melt that, later in the season, could be exacerbated by spring rains and still frozen ground. 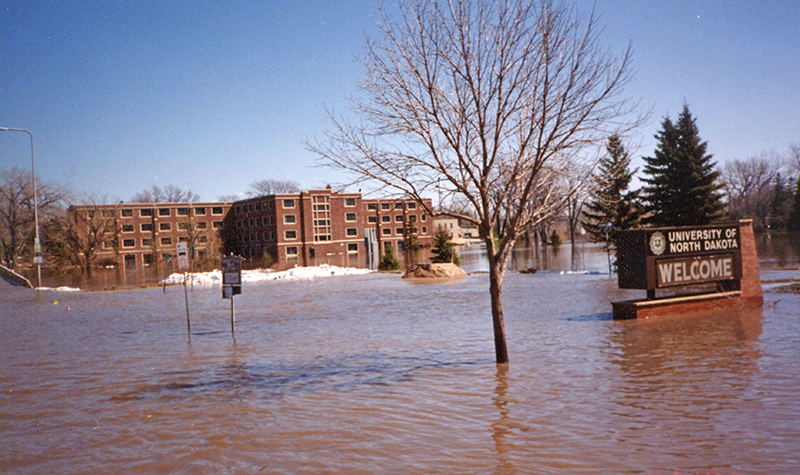 A “Welcome” sign along University Avenue, looking east toward Smith Hall, provided a deceiving message for anyone trying to venture into floodwaters in April 1997. Image courtesy of Richard Larson. Berger, the emergency management director, said her office is extensively collaborating with UND’s Facilities to ensure the safety of campus if a flood does occur this spring. Buildings’ flood insurance has already been evaluated and deemed adequate, she said. Still, some structures require particular attention due to either their contents or locations. Merrifield, for instance, holds telecommunication equipment in its basement, while Wilkerson rests close to the English Coulee. The latter, however, has a flood gate to keep surging water away. Buildings, plumber supervisor Mark Berry said, have valves that could be shut off to prevent backup water from gushing in from sewers. Pumps around campus are also designed to keep UND edifices dry. Berry said his crew is amid testing all pumps as part of an annual spring procedure. “We do our preparation regardless,” he said. 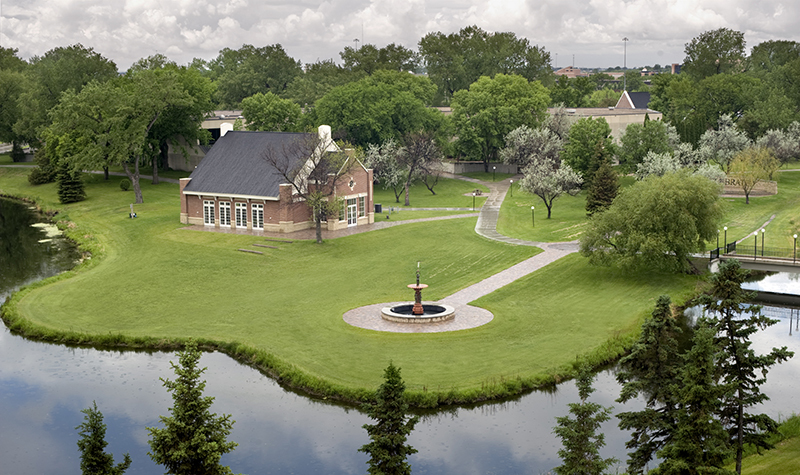 The English Coulee, which snakes around campus, is a main watch area for UND as the community readies for a potential flood. While sandbagging along the stream is an option, the City’s diversion channel and pumps are expected to keep the Coulee in check. UND archival photo. Meandering through campus, the English Coulee is on everyone’s radar. While its level has not yet posted significant rises, Berry said he drives by it and checks it regularly. Emergency Management and Facilities are prepared to sandbag portions of the stream if the need arises. The English Coulee diversion channel has the capacity to direct most overflow water into the Red River. Yet, some internal city drainage, pooled into the Coulee, is also collected by city pumps, some of the largest in Grand Forks’ flood protection system, according to the city’s flood protection web page. 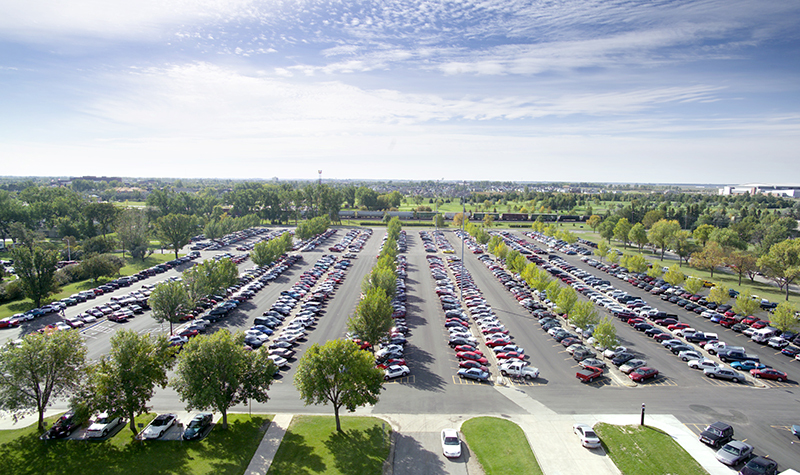 UND extensively cooperates with the city’s management to prepare, respond and repair in the event of flooding. “Just like every resident in town, we rely on the city,” Berry said. The City of Grand Forks is mulling an emergency declaration that could come as early as next week, allowing the community to access resources from the state as well as the Federal Emergency Management Agency. Grand Forks County just issued one, following Cass County and the City of Fargo. Fargo is asking volunteers to fill 1 million of sandbags. If Grand Forks orchestrates such an effort (the county is already distributing sandbags for pickup by residents), UND is prepared to inform students, faculty and staff how they could help, Berger said. Information dissemination is a major part of Berger’s duties. Her office is already collaborating with the Division of Marketing & Communications to maintain a UND blog with the latest updates on spring thaw and possible flooding. 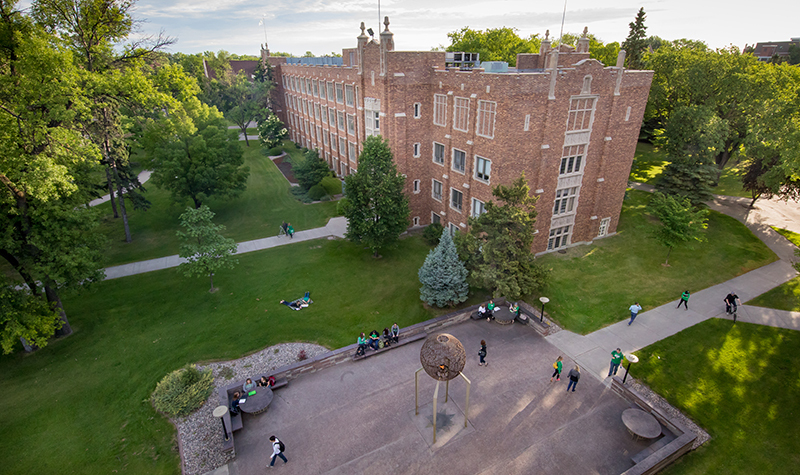 The Safe Campus UND app and UND Alerts, instant, campus-wide emails, are to also carry flooding notices.